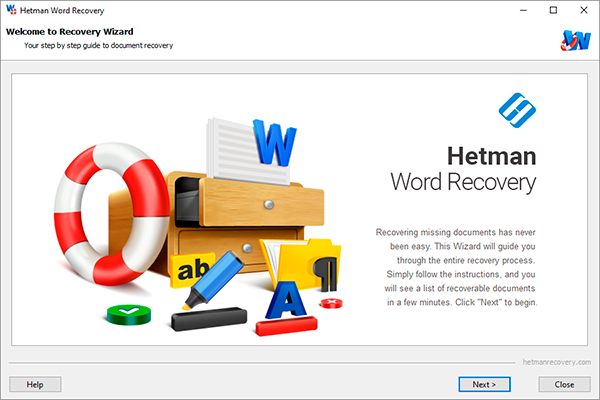 Hetman Word Recovery is a heavy-duty tool to recover Microsoft Word and OpenOffice documents from formatted, repartitioned, corrupted and inaccessible devices. Implementing a number of safety features and a special Safe Recovery mode, Hetman Word Recovery is ideal when you need to recover documents from a badly damaged, worn out or physically unstable hard drive. Compatible with all common Microsoft Word and Open Office document formats, Hetman Word Recovery can recover DOC, DOCX and ODT files. In addition, the tool can recover files in Adobe PDF format. Hetman Word Recovery is designed to offer as much power to an ordinary computer user as possible. Offering complete automation, Hetman Word Recovery is driven with a fully guided wizard, enabling step by step operation via the convenient user interface. The pre-recovery preview allows viewing documents being recovered before they are saved, allowing the user to choose the right document from the long list of available files. Unlike competing data recovery tools, Hetman Word Recovery offers a 100% success guarantee. Every document you see in the list of recoverable files is guaranteed to result in a successful recovery or a healthy, usable document. This unprecedented success rate is achieved by performing a pre-recovery integrity check on every document discovered during the disk scan. Hetman Word Recovery only allows 100% perfect, complete and healthy document to make it into the recovery list. As a result, you won't see thousands of junk entries making the list crowded and difficult to navigate. Hetman Word Recovery is designed with safe recovery in mind. Implementing a special extra safe mode for physically unstable devices, program can create a bit-precise copy of the entire storage device in a single read operation. This approach minimized the number of head movements, greatly increasing the chance of successful recovery. The actual recovery is then performed on a virtual image of the device. Fabreasy PDF Creator (Popularity: ) : The PDF Creator for you and your business!